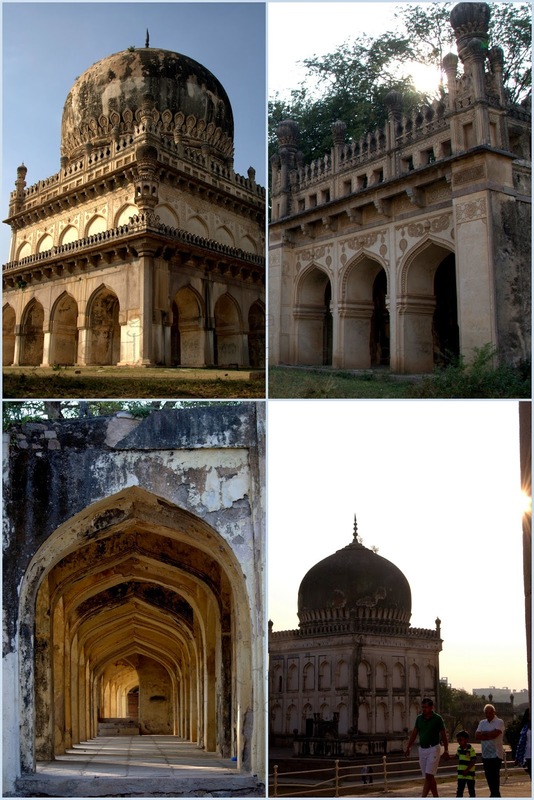 We visited Hyderabad last week during the Christmas time. We don't celebrate festivals much and have a tendency to run away from home by the end of the year for sometime. For valid reasons of course. While traveling, we want to soak into the local culture, history and landscape wherever we go and try and taste the local foods whenever possible. This time we could not taste much of local foods in Hyderabad as we found ourselves spending time with other activities. Some time was spent visiting the historical monuments, some more time being closer to nature, closer to the origin of food. Good food. 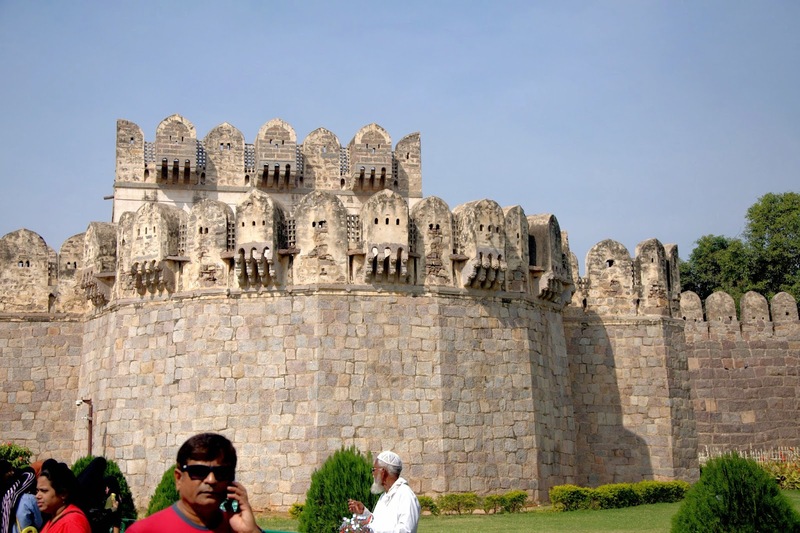 The Golconda fort at Hyderabad is an engineering marvel. One has to see it to believe it, how protected the fort was and how well it was equipped to carry messages in the form of rhythmic clapping to the other end of the fort. 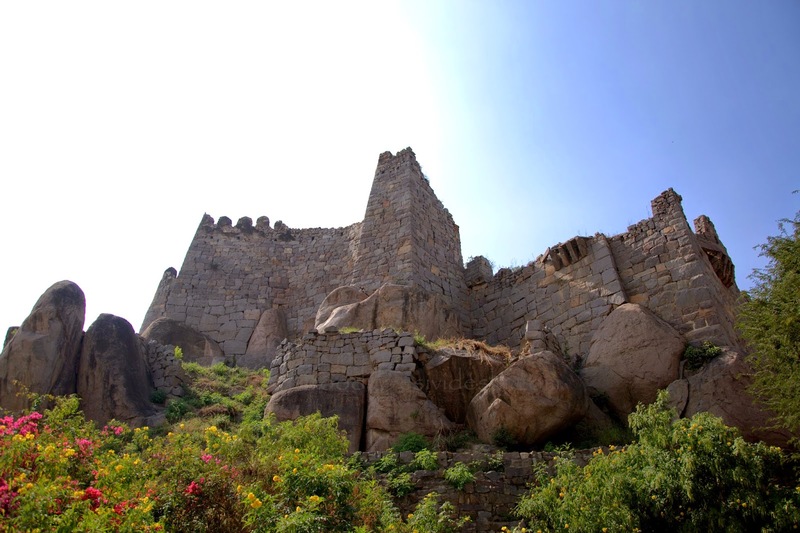 The fort is built on a hillock, the natural boulders have not been been cut and the fort has been built along with them. It is fascinating to see huge boulders jutting out of the walls at some places. There are many water reservoirs, hidden mud pipelines and hammams (community washrooms) with water heating facilities and the sound acoustics in some parts of the fort is admirable. While we would remember Hyderabad for the Qutub shahi monuments, the tomb complex of Qutub shahi rulers and the Golconda fort built by them, we have more reasons to remember this place thanks to my friend Bhavana who introduced me to Madhu Reddy, a farmer who is practicing her belief in chemical (synthetic chemicals) free framing at her ancestral farm at Yacharam village, 55 Kms from Hyderabad city. The farm is called Aiyor Bai. 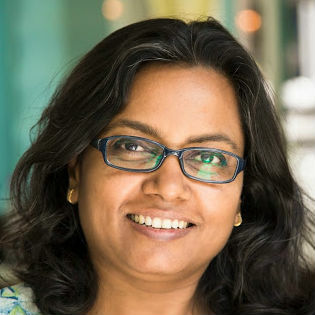 There is a lot to learn from Madhu. Farming in an arid land is not easy, she makes her own manure by different natural techniques and uses drip irrigation for better water management. She encourages shrubby legumes to grow below the orchard trees to enrich the soil as well as to add more organic matter to the soil. 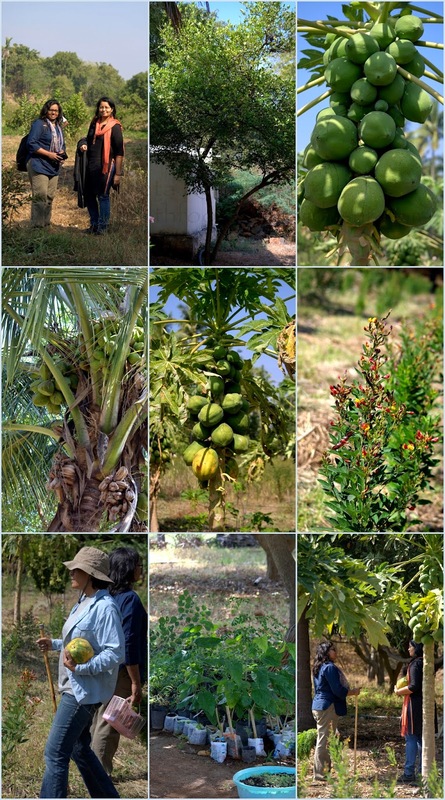 Her aim is develop a forest like microecology with mixed fruit orchard and farm that sustains itself like natural forests do. I wish more farmers follow this model to grow food for the masses and more people respect food grown ethically. I actually felt very much at home at the farm, if only I owned a piece of farm land somewhere. 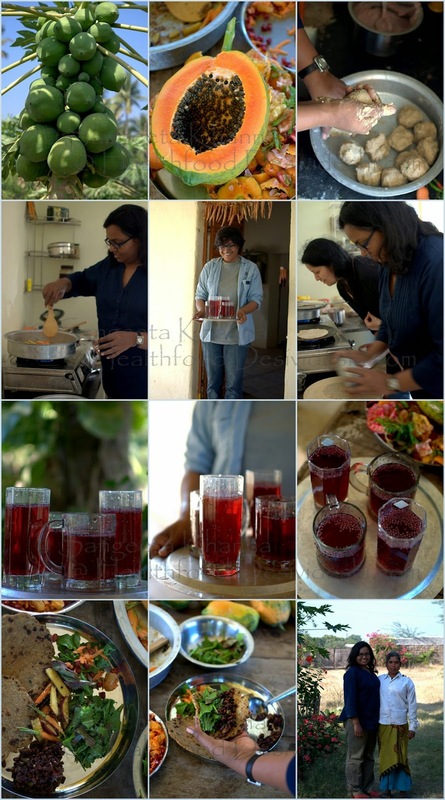 We enjoyed a warm malted ragi drink that Madhu made for us and went out to see the farm. We loved that malted ragi drink, I had another helping in fact. 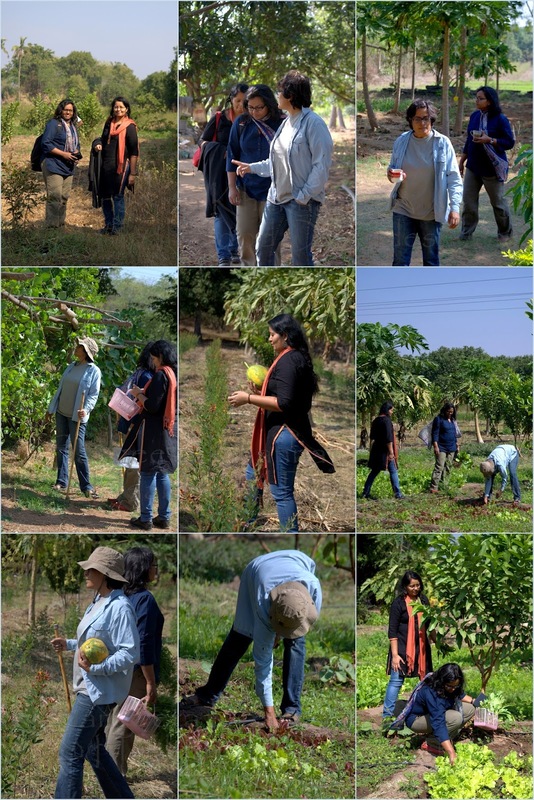 Here is Madhu showing us around, educating us as we harvest a few vegetables and fruits for our lunch. Yes, I cooked lunch at the farm, with minimal utensils available. 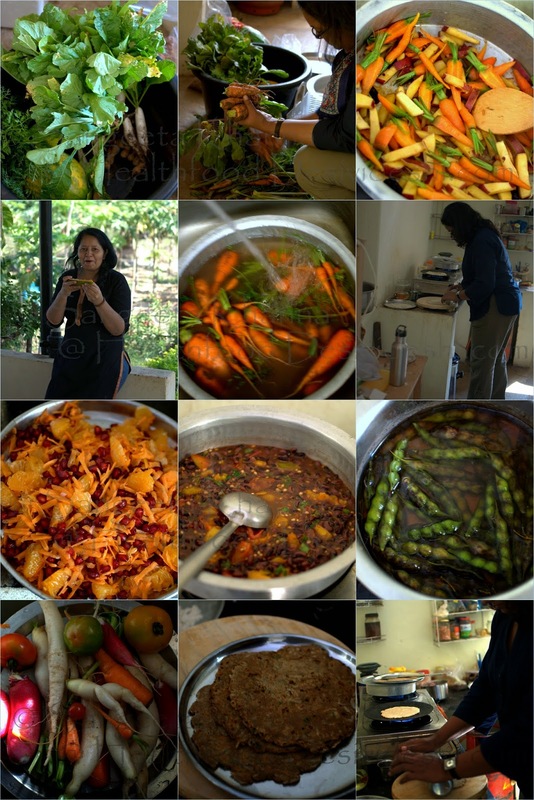 My friend Bhavana helped in the kitchen, Arvind clicked pictures and we had a lovely time together. To cherish for a long time. We harvested carrots, thinned down the clumps of carrots growing together and got some really nice baby carrots too. Some white and pink radishes, loads of papaya, loads of mixed salad greens and baby spinach was plucked to make a mixed greens salad. Found a few ripe tomatoes to be used for salads or curry. I wasn't sure by this time what we will cook, but baby carrots were destined to be caramelized for a warm salad I had already decided. Then I saw sweet potato vines and decided to add some sweet potatoes to the warm salad as well. Recipe of this salad will be shared later. The bigger carrots were grated and mixed with some Pomegranate seeds and Orange segments to make a cold salad. Since there was nothing to make any dressing, I added a bit of salty residue of the Hing peda (a chooran goil by Patanjali) to this salad and it was so good the salad vanished quickly. Lack of a dressing did not bother us and we created a mixed greens salad just with salt and lime juice. There was no pepper, no oil apart from refined oil (that I detest normally) but there was good quality pink rock salt and fresh limes and coriander greens growing at the farm. The mixed greens massaged lightly with pink salt and lime juice were really great. The mix of Endives, Lolla rossa, Butter crunch, green garlic shoots, baby spinach and a few coriander greens tasted so good together. Madhu also got some fresh coconuts plucked, Arvind broke one and scooped out the coconut meat that we snacked upon. A coconut so freshly plucked was a first time experience. We also harvested some fresh Toor (Arhar/Pigeon peas) legumes and decided to boil them for a warm snack. Madhu had some very nice native variety of black eyed peas at the farm. I cooked a chilli kind of curry with it with 3 varieties of tomatoes added to it. 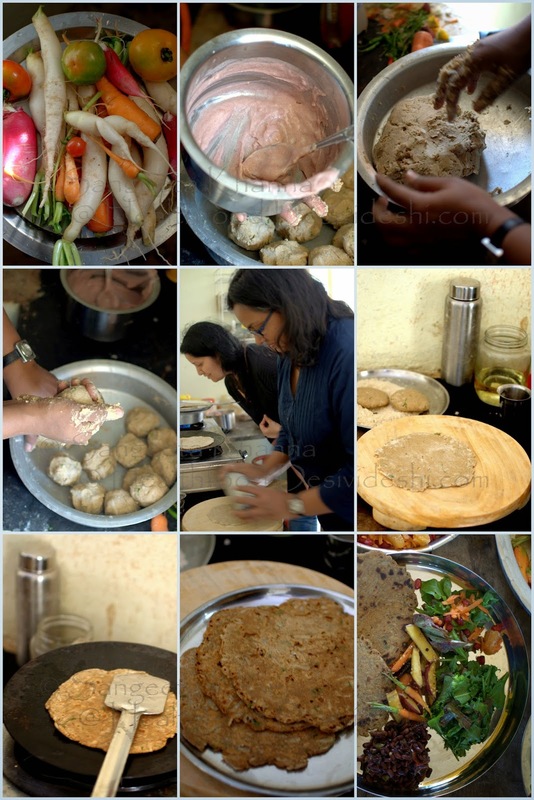 She had some red rice flour and Jowar (millet) flour and talked of a mooli paratha. I decided to make a mooli paratha with these 2 types of flours added (recipe below). I am using approximate measurements as I just eyeballed everything for this paratha. Mix the rice flour with 1.5 cup of water and 1 tsp salt. Now cook this mixture till it becomes a gruel and bubbles and spews hot air as the bubbles burst. It should be a cake batter consistency. Now mix the grated radish, other chopped ingredients and jowar flour and massage well together. Add the cooked rice gruel little by little to bind the dough. Some of the rice gruel may get leftover. Make 10-12 balls of manageable size and keep aside. Roll each ball of dough, dusting it nicely to make round flat breads. Heat a tawa (flat base pan), brush with oil, lift the rolled flat bread and slap it on the hot tawa, cook on both sides brushed with little oil till small brown spots appear and the paratha becomes firm. Repeat with all the rolled parathas (flat breads) and serve as required. Best served hot but we had it warm. 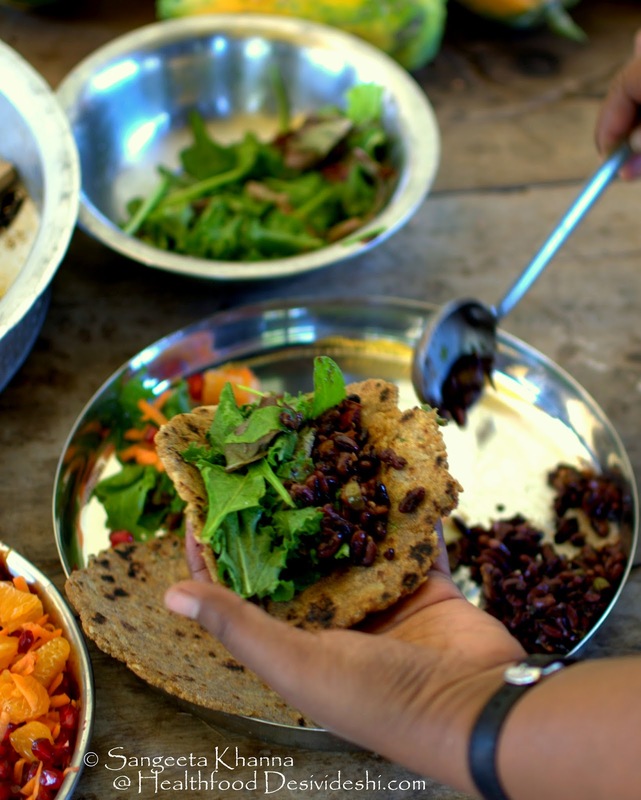 At the time of serving we decided to make burrito style rolls with the cooked black eyes peas and the mixed greens salad. This was a tasty filling meal that satisfies the soul. We had already steeped some Roselle seeds in hot water and set it to cool to make a drink with it. Some basil seeds were soaked to top up the drink, a little honey was added to it and it made such a refreshing drink after a working day at the farm. I hope Madhu enjoyed as much as we did. Later a lady farm-worker Eswar amma came to complement me about the food. She looked quite happy while doing so and I believe her complement was genuine, else I know the farm workers don't like the salads etc much. Look at the lush growth of papaya trees at the farm. We came back with more papayas to eat for breakfast the next day. The fruits of learning stay with us for long time. We are already planning to go back to Aiyor Bai again sometime soon. Such is the way unspoiled nature attracts you. you are a marvel girl.. you know to play around vegetables and turn out the most healthy dish..Hope you had a good trip in Hyderabad..